* Casting resin is highly flammable - keep it away from flames & heat. Always wear a respirator mask, gloves and safety glasses when using resin. Making resin cast items is a creative and popular craft project that can be done at home. A resin cast is formed when resin and a chemical catalyst are combined to form a hard, plastic-like material. These casts can be customized by pouring resin into molds, adding colors and embedding items. Items that can be made include paperweights and keychains. 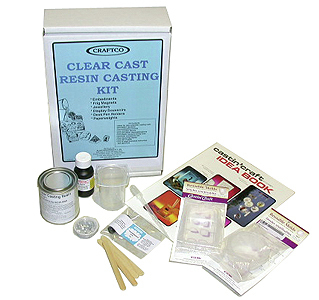 Resin casting supplies and complete kits can be found at local hobby and craft stores (such as Michael's Arts, Hobby Lobby, and other Crafts stores, as well as through many online retailers and Ebay. Everything you need to cast your own paperweights, keychains and displays are included in these kits. The kits typically come complete with Clear Casting resin and a catalyst, embedding molds, wooden stirrers, a pair of plastic disposable gloves, two plastic measuring cups, 5ml of resin dye, a measuring pipette, a vial of glitter and an instruction book. Among the many items that can be made with Clear-cast are fridge magnets, ashtrays, desk pen holders, display souvenirs, paperweights, figurines, keychains, embedding natural objects, and jewelery. Tap Plastics is a leading supplier of hobby casting resins. 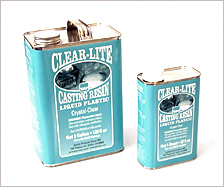 Their "Clear-lite" casting resin is a popular choice among many home hobbyists who make their own Resin cast items. Polyester resin is sold under several different names: Easy Cast, by Cast ‘N Craft, Silmar 41, by U.S. Composites, EP4101, by Eager Polymers. To determine whether resin is Polyester, other than reading the fine print on the label of the can of material at the local Hobby Lobby, or Michael’s or finding the MSDS (Material Safety Data Sheet), is to see if the material is catalyzed with MEKP (Methyl Ethyl Ketone Peroxide). The Polyester Resin that is best to use is the resin for thick casting. It is a laminating resin and the surface will remain tacky, unless post cured. The surface remains tacky so that more layers can be added and they will adhere to each other without scuffing up the surface. It has been around for so long that most people are familiar with the process in some way or another. It is the same material used to fiberglass boats, to repair car fenders & used to make surfboards. It is relatively easy to work with. It is inexpensive, around $40 with S&H for 1 gallon of material with catalyst. There is a shelf life on Polyester Resin. From the moment it is manufactured it is beginning to cure. Under normal conditions it will self-accelerate (cure) in approximately 6 months. If it is in a warm environment it could cure in less time, stored in a cold environment it could last more than a year. The optimal time to use your Polyester Resin is within 6 months of its manufacture. Polyester Resin is cured rapidly by the addition of MEKP catalyst. The use of 3-5 drops of MEKP per ounce of resin will result in a longer cure time but more durable product. What does one need to work with Polyester Resin? wax or silicon paper to cover the work table, silicon paper is best. What should I cast in? You can use Tupperwear containers. You can order mold trays. You can order pen blank molds. You can use PVC pipe from the local hardware store, to make your own molds, pipe end plugs. Or you can use tape or clean clay to plug the bottom. If you are using food containers to cast in make sure that they are made of Polyethylene Taranpthalate (PETE), High Density Polyethylene (HDPE), or Polypropylene (PP) plastics, recycling codes 1, 2, and 5. Amber pill bottles that are made of Polypropylene can be used for half-blanks and bottle stopper molds. Or you can make your own molds from wood, poly cutting boards from the store, or make them in latex or silicone RTV rubber. If you use wood to make your mold you will need to use a mold release. Where do I get Polyester Resin and supplies? The local Hobby Lobby and Michael’s carry the Cast’n Craft, Easy Cast Clear Casting Resin. They carry it in pint and quart cans. One down-side of buying it from them is that you don’t know how long it has been sitting on the shelf. Another is the cost. U.S. Composites sells Silmar 41 Thick casting Polyester Resin, and liquid/paste dyes. They are mail order, but they deliver fast and are the least expensive for the best quality resin. Eager Polymers carries EP4101 thick casting Polyester Resin, and a line of liquid dyes. They are more expensive and have a greater S&H costs. Liquid Latex Mold Builder is available from Hobby Lobby, Michael’s, or A.C. Moore. RTV Silicone is available from Reynolds Advanced Materials. Jacquard Pearl-Ex Powdered Pigments are available direct or locally from Hobby Lobby (8 colors), A.C. Moore (12 colors) or the full Pearl-Ex line is available from Reddi Arts or Crafts’n More. Powdered pigments are also available from Coastal Scents. They have a larger lineup of colors than Jacquard, and are cheaper if you buy in larger bulk quantities. The downside is that they are mail-order. Cast’n Craft Liquid Pigments are also available at Hobby Lobby. Surf Source carries a nice line of opaque and transparent liquid pigments. Our project is going to be to cast a 3 metric oz (moz) bottle stopper and a 4 moz - 2 cavity mold. We will be using 7 moz of resin. You will need 4 cups. Marked at 5 moz, 3 moz, 2 moz, 1 moz. 1 metric ounce is 30 milliliters. Dispense 5 moz of resin into one cup and 2 moz of resin into another cup. Hold the cups marked at 3 and 1 in reserve. Our pigment additions will total approximately 5% or less of the volume of the resin in the 5 moz and the 2 moz cups. • The 5 moz cup contains 150 ml of resin, so we can add up to 7.5 ml of additives. • The 2 moz cup contains 60 ml of resin, so we can add up to 3 ml of additives. Add MEKP to both cups of resin at the rate of 4 drops per moz and mix thoroughly. The count would be 8 drops for the 2 moz cup and 20 drops for the 5 moz cup. In the 2 moz cup add .2 ml of yellow liquid dye and mix thoroughly. The resin will resemble lemon meringue in color. Decant 1 moz of the gold mixture into the marked cup held aside. In the 5 moz cup add .2 ml orange, and .3 ml blue liquid dye and mix thoroughly. The resin will resemble prune juice in color. Decant 3 moz of the purple mixture into the marked cup held aside. Continue to mix and wait for resin to get close to gel this will take approx 50 minutes. Pour into molds and set aside or put under pressure for 24 hrs. Post cure for 1 hour at 125 degrees Fahrenheit. Here is an exciting idea that you can do at home for a hobby or profit. You can cast paperweights from clear casting resin using molds. We will explore how to do this successfully for hobby or profit. The first thing we will need is the casting resin and materials. The place to get the resin and catalyst is obviously your local hobby shop. You will also need something to serve as a plastic mold. It could be a cup, cupcake pan or something a little more creative. If your intent is to sell then you may wish to use molds shaped like animals, stars, common objects. Let's be creative and have fun. Next, you need to do this in a well ventilated area as the resin material will give off fumes. Also remember not to smoke or have anything flaming like a candle anywhere near the work areas so you don't start a fire, and the resin fumes along with cigarette smoke would be very hurtful to your lungs. Now resin hardens into a hard, plastic like material and can damage clothing, your work space and such so you need to protect the area, and yourself, from it. You can wear and old apron or work clothes that you don't mind getting stuff on. Put down paper on your work area and if you must work in a poorly ventilated area then you should wear an approved respirator that will protect you from the fumes. You should also wear disposable rubber gloves to protect your hands as the chemicals can penetrate the skin and could cause illness. Safety is a must when you are working with these chemicals and materials. Now choose decorations that you want to be embedded in the resin in the molds. For this you can use almost anything that is colorful and pleasing. They could be party sparkles, marbles or anything that pleases you in its color and appearance. Remember that some things will float in the resin and some things will sink. That is an issue that you will have to deal with as you go along. Now add some of your colorful items into the mold and mix up the resin and the catalyst to make it set. Follow the label directions for the right proportions. It is a good idea to use a disposable plastic cup that you just throw away when done. Begin pouring the resin slowly in layers over your colored items. If you are using items that float then it can take longer as you will need to let each successive layer set at least partially so that the items don't stick out of the resin. For this purpose, you may wish to keep the items a little away from the edge of the mold so that they will not stick out from the sides either. An initial layer of resin can also prevent this from happening on the bottom if you wish. Once you reach the desired depth and are satisfied with the way it looks, the next thing is to let it set. Overnight will work for this. It takes hours for the resin to fully set. Once it is set, it is time to remove it from the mold. If you a sculptor type person and artistic, you can maybe shave a little off here and there to give it a hand crafted appearance. A hobby razor knife is a good bet, or if you have sculptor's tools. You will be carving on resin so it could be you will not like the appearance once you do. Some very fine emery paper might just do the trick for smoothing out carving marks. For a really great effect, you may wish to try different coloring for your creations. Dyes are available so you are not limited to a simple clear resin by any means. It might be a good idea to experiment on a small scale till you get the effect that you want. One thing you could try is to make small items first, embedding them into larger pieces of resin for different effects. It is possible also to get small lights that flash on and off continuously and while they will not last forever, putting one of these things in resin would fascinate and awe people. You can also try (if you can find one small enough, putting a small solar operated device like a dancing flower which will operate any time the paperweight is exposed to light. The trick would be to enclose the item in some kind of container, even one made from resin if you are clever enough to find a way to do this. It would be a unique novelty and might bring in some profit for you if you wish to sell in a store or on Ebay. Also consider putting a small picture inside of the paperweight, or even a hologram. This type of thing would make a great hobby to sell and would make impressive gifts for others. Your pride and professionalism can be shown off by your imagination, determination and skill. Have fun and use your creativity and brilliance to produce your masterpiece!